The Museum at Eldridge Street clearly knows that the best way to keep a crowd’s attention is to offer a little something to eat. That’s why their upcoming tour, Passover Nosh & Stroll – Jewish Landmarks of the Lower East Side, sounds like the best way to celebrate the Pesach holiday. Beginning at the landmarked synagogue “with a kosher-for-Passover ‘feast’ of matzo, cream cheese, jam, pickles and chocolate from Streit’s Matzo and The Pickle Guys,” the tour will then visit the historic and culinary institutions of the old Jewish Lower East Side, including the Forward Newspaper Building, Jarmulowsky Bank, Loew’s Theatre, Bes Medrash Hagadol Synagogue and Economy Candy. As we previously noted, “Between 1880 and 1924, 2.5 million mostly-impoverished Ashkenazi Jews came to the US and nearly 75 percent took up residence on the Lower East Side,” earning it the title of the “capital of Jewish America.” The Eldridge Street Synagogue opened its doors in 1887 to a congregation of mostly Polish and Russian immigrants, marking the first time in the country that Jews of Eastern European descent had built a synagogue from the ground up. The Moorish-style synagogue flourished for 50 years, but by the 1940s much of its congregation had moved elsewhere and it shut its doors. Thanks to efforts by preservationists, the building underwent an $18.5 million restoration in the 1980s that transformed it into a public educational and cultural center. 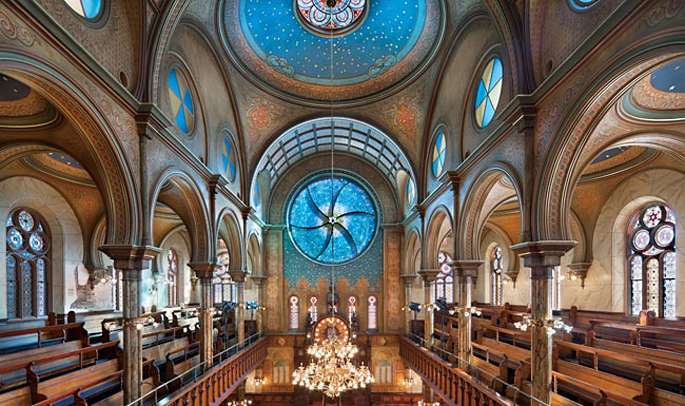 Today, the Museum at Eldridge Street offers countless programs about Judaism, Jewish culture, and the Lower East Side, but still functions as an orthodox synagogue on Saturdays and holidays. In fact, since its founding, the congregation has never missed a single week of worship. 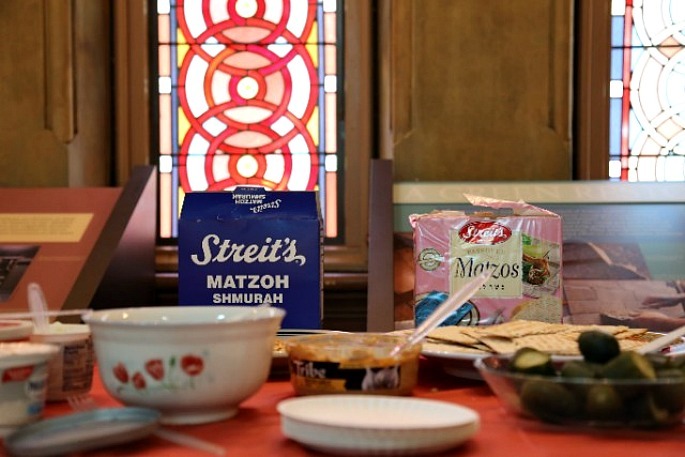 It’s especially exciting that Streit’s, the last family-owned matzo factory in the U.S., is catering since they are moving to New Jersey after 90 years on Rivington Street. The tours will take place on Tuesday, April 7 and Wednesday, April 8 at 2pm and cost $25/person. For a tour of just the synagogue, along with the feast, tickets are $12. You can RSVP here.